Favorite Line: "Have you ever had a weird feeling like you unexpectedly walked into one of the highlights of your life, one that you'll probably want to tell your grandkids about someday or write about in your autobiography?" This review is based on an advance reader's edition. MY NAME IS FINN GARRETT AND THIS IS MY STORY. I don't want to give anything away, so I'll tell you what you could probably guess from looking at the cover and flipping through the book. 1. It's about an invisible boy. Obviously. That's me. Actually, I'm not totally invisible. Yet. But I'm getting there. 2. There are a bunch of my drawings. 3. There are some really funny, really happy moments. 4. Just so you know, there are also some sad moments. 5. Everything in here is the truth. So if you like stories about true things, you might like this book. That's all I'm going to tell you. All the stuff about my dad and my mom and my brother Derek and my friend Meli and whether or not I actually turn invisible or become completely visible again or figure out how to use my invisibility for the good of all mankind or just disappear altogether, you're going to have to read to find out. So, let's get started. Just remember: This is my story, and anything can happen. The dustjacket for this book was so intriguing to me that I immediately wanted to read it. And I did read it- all in one sitting as well! And as you can probably tell by the haphazard updates to this blog- the extensive reading in one sitting does not happen often any more at all. Finn is a 12-year-old boy who lost his father suddenly over the summer and, as a consequence, his body reacts to the stress by turning his hair white and making his skin pale. Finn therefore thinks he is becoming invisible. A feeling many 12-year-olds face, even without the additional stress of losing a parent. 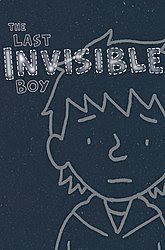 I think The Last Invisible Boy was a very well-written book. It was very believable that a 12-year-old was the narrator, and that he was going through a lonely and painful period of mourning for his father. The book is sprinkled with memories over the course of Finn's life, with other stories coming from his brother, his mother and his grandfather. It also is full of explanations of every single person's name- this was somewhat puzzling as it didn't really seem to add anything to the story, but maybe that's just one of Finn's "things." This is the first I'd heard of this book. Thanks for the great review! I'm a big fan of diary-style books so I'll have to give this one a shot.